In this article, we will take a look at one of the world’s most influential individual and perhaps the most significant figure in the automobile world. Our subject of attention today is well celebrated for his assembly-line method of manufacturing of automobiles. Henry Ford is best known as the owner of Ford Motor Company. His assembly-line formula did not only make the production of automobiles faster and cheaper, but it also gave the middle-class persons the opportunity to own cars, during a time when cars were only affordable to the wealthy. Henry Ford was born on July 30, 1863, in Greenfield Township, Michigan, to Mary and William Ford. As a kid, Ford was a smart and curious kind. He started demonstrating his mechanical abilities when his dad bought him a pocket watch, he was curious to know how the timepiece worked, which prompted him to dismantle it and reassembled it by himself. He went on to do the same to the watches of his neighbor and his friends, earning him the reputation of a watch repairman. In 1879, Ford left home after the death of his mother and began working as an apprentice machinist for James F. Flower & Bros. He later worked for Detroit Dry Dock Co. until 1882, when he returned home. On his return back home, he started working as a steam engine repairman for the Westinghouse Company. Henry Ford in 1891 began working for Edison Electric Illuminating Company as a night engineer. Ford found his new job exciting as he learned a whole lot about electricity, being that electricity was a new discovery at that time. After two years of working at the Illuminating Company, he was promoted to the position of chief engineer. His new position gave him the time and finance he needed to work on his personal project. In 1896, Ford completed his personal project, a self-propelled automobile which he called Ford Quadricycle. He received approval from his boss Thomas Edison, who encouraged Ford to construct another vehicle, and Ford completed his second automobile in 1898. Subsequently, he resigned from Edison Company and went ahead to establish the Detroit Automobile Company on August 5, 1899. He began producing automobiles under his new company but the vehicles were of low quality and had high price tags. The company did not live up to Ford’s expectations and was shut down in 1901. In October 1901, Ford worked on improving the quality of his automobile and through Harold Wills’ help, he built a 26-horsepower automobile. Seeing that Ford’s new project was successful, stockholders from the Detroit Automobile Company then formed the Henry Ford company on November 30, 1901, with Ford as the company’s chief engineer. After several troubles in the company, Ford left the company and it was renamed as Cadillac Automobile Company. On June 16, 1903, the Ford Motor Company was founded and launched with $28,000 cash from twelve investors. The company has since gone on to become the second largest U.S. based automobile company behind General Motors. 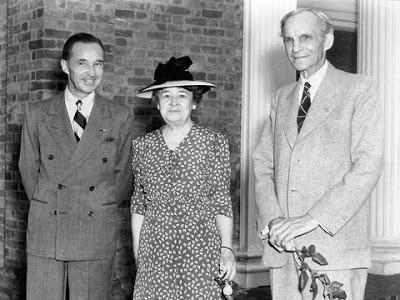 Henry Ford retired in September 1945 and handed the presidency of the Ford Motor Company to his grandson, Henry Ford II. On April 7, 1947, a few months to his 84th birthday, Ford passed away. His death was a result of a cerebral hemorrhage. Unlike what most people think, Henry Ford did not invent the automobile or the assembly-line but he introduced several other important aspects of the automobile such as the traction engine, clutch, piston ring, valve mechanism, starter gear, crankshaft, carburetor, and air washer & filter. He also manufactured the first automobile, The Model T automobile, that was cheap for many middle-class Americans. Ford was married to Clara Jane Bryant. The couple got married on April 11, 1888. Clara was born in 1866 and she died in 1950. The couple had just one child, a son named Edsel Ford. He was born on November 6, 1893, in Detroit, Michigan and he became Ford Motor Company’s president from 1919 to 1943. Edsel Ford was married to Eleanor Clay and they had 4 kids together. Edsel died on May 26, 1943, after he suffered from metastatic stomach cancer and undulant fever. Henry Ford’s father was William Ford, an Irish-American farmer, and businessman. He was born on December 10, 1826, in Ballinascarthy, County Cork, Ireland. William’s parents were John and Thomasine Ford. He had 6 siblings. William was married to a Belgian-America lady named Mary Litogot and together they had six children, which included Henry Ford. Mary Ford was born in Michigan in 1839 as the youngest child of her parents. Her parents are Belgians who immigrated to the United States. Henry was the founder of the Ford Motor Company. He revolutionized the automobile industry. Through hard work and complete dedication to his business, Henry was able to establish himself as one of the world’s richest people. By Introducing the Model T, almost everybody owned a ride. It had a steering wheel on the left hand which was soon copied by other car producing companies. He built 7 learning institutions in different places in the U.S. In 1928, he was awarded the Franklin Institute’s, Elliott Cresson Medal.